An interesting, yet emotionally unfulfilling ride through the experiences of a holistic-minded Main Character. Yes, I know it’s a bummer we had to wait four years for a Christopher Nolan film that wasn’t about brooding superheroes, and we ended up with this melodramatic space opera. And yes I know that while we love and eagerly anticipate a new Hans Zimmer score, that this one was mixed so indelibly loud as if to be to assaultive and less enjoyable than soundtracks past. But there is a tangible reason why we couldn’t get into the film and an explanation for why it scored a meager 74% on Rotten Tomatoes. Look past the underdeveloped Influence Character Throughline and the practically non-existent Relationship Story Throughline. Look beyond surrogate Influence Character Brand’s (Anne Hathaway’s) seemingly out-of-nowhere diatribe about the “power of love.” And avert your eyes from the rather large, but practically unspoken about, elephant in the room (Why not? Everyone else did! ): these “beings” from beyond that construct wormholes and 5th dimension tesseracts for us to play in. The real reason we found it difficult to connect to the film? Main Character Cooper solved problems holistically. Generally speaking male audience members find it close to impossible to empathize with holistic problem-solvers. They don’t get people who don’t think like they do. Unless they are presented a clearly definable step-by-step progression from one conclusion to the next, linear thinkers can’t follow the kind of leaps of logic (what they call intuition) that a holistic problem solver makes. Cooper (Matthew McConaughey) sees the big picture. School authorities suspend his daughter because Cooper can’t stay silent on the connections he sees. He repurposes Air Force drones to drive his combines and he measures all options for the human race at once, rather than focusing almost pigheaded on Plan B like his fellow astronauts. Linear thinkers get Mann (Matt Damon) and Brand and Plan B. They don’t understand someone open to connections and the relationships between things. 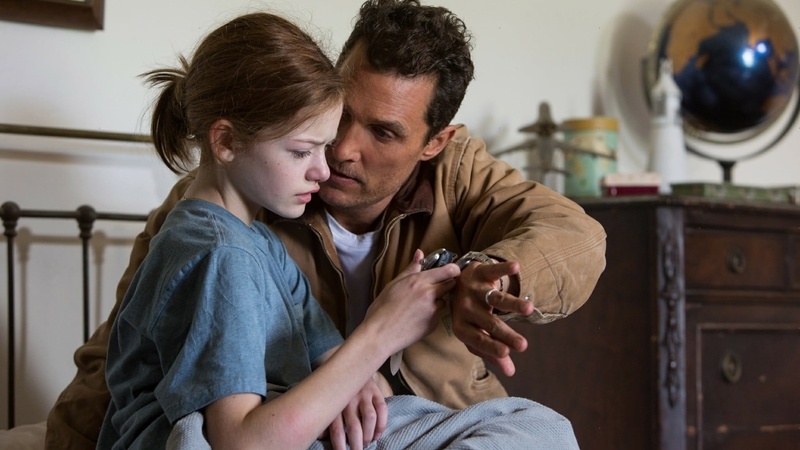 Whether it be gravity or love, powerful forces operate within the narrative universe of Interstellar. It takes someone comfortable with the weight of “mass” and the dynamics between things to recognize and come to terms with both of these forces. Cooper fit that role perfectly. Unfortunately for many critics and fans of Christoher Nolan films (both groups predominantly comprised of linear “male” thinkers), a character operating on this level presents a significant challenge towards emotional investment. So before you write off this film entirely, take the time to recognize time. The limits your linear-based mind impose on this 4th dimension skew your appreciation of the universe and tarnish the argument presented by this narrative. Time, after all, is not fixed. It’s relative.